What’s your healthcare brand’s Digital EKG? During an annual exam, your physician can get a good sense of your heart health with an EKG. As healthcare marketers, a Brand EKG can also give you a quick read of your brand’s health. Several years ago, this model was introduced to help hospitals, namely C-Suite representatives, understand consumer research findings and implications. As indicated above and based on the classic consumer marketing behavior model, a brand has to have established a strong sense of awareness and preference before leading to trial. This model has been expanded to include brand attributes such as likability, intent to recommend, and other layers of behavior. 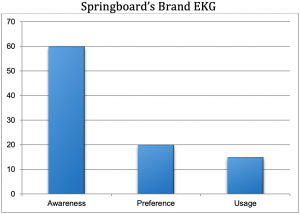 Based on an analysis of nearly 100 consumer studies, and validated by leading healthcare researchers, we concluded that a “healthy” brand EKG would have a variance of 12-15 percentage points between key indicators. A larger number would indicate an “unhealthy” brand that is not converting on the preceding attitude. For example, a brand with a preference score 20 percentage points higher than usage is not converting market share. This could be the result of many factors including accessibility, customer service, and operational considerations (schedule, capacity, etc.). Those brands not converting awareness to preference indicate a lack of differentiation or strong consumer brand relevance. Fast forward to 2019, and the same model can be used to assess the health of your digital marketing efforts. Healthcare marketers can add to their digital dashboards by providing a Digital Brand EKG indicating the level of conversion being established from a preceding behavior. 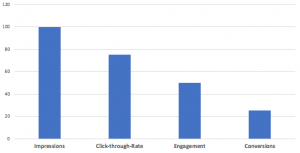 For example, if impressions served (or similar metric) are significantly higher than CTR, you’ve done a good job targeting and delivering your digital message but you have not enticed anyone to take action. If you’re creating an action and people are clicking through but not engaging, then your landing page, website, or other content “hub” is not compelling enough. Adding an EKG to your current digital dashboard will help you and your team understand the layers of consumer behavior that are taking place with each online activity. Better yet, you’ll be able to develop content strategies and tactics to improve upon your ability to convert consumers through the behavior model. Better still, you’ll be able to strengthen the other metrics on your dashboard and impress the C-Suite with the health of your brand and EKG in terms (and formats) they’ll understand and appreciate. You might even be able to include B.D. initials after your name – Brand Doctor. Happy to help you assess your brand and digital health. Contact us today.